Rare Picasso Works Steal the Show | Fine Jewelry Auction | Skinner | Skinner Inc.
BOSTON, MA – March 25, 2013 – Skinner, Inc. saw excellent results from its auction of Fine Jewelry last week: a robust presentation of more than 500 lots that earned over $2.7 million. Drawing a great deal of excitement was the sale of three rare pieces of jewelry by Pablo Picasso, each on the block for the first time. Also performing well were signed pieces by Buccellati and Cartier, fine Art Nouveau jewels, a selection of natural pearls, diamond jewelry and period gems. Skinner presented a rare opportunity to own a “tiny sculpture” by Picasso with the offering of three scarce, early jewelry pieces by the artist. Early in his career, in the 1950s, Picasso made a series of one-of-a-kind jewelry pieces, giving three of these pieces to Françoise Gilot, the mother of two of his children, Claude and Paloma Picasso. Gilot later passed the jewelry on to Carole Mallory, supermodel, actress, and author, who was engaged to Claude in the 1960s. The jewelry had been in her possession ever since. All three pieces smashed the pre-sale estimates of $15,000 to $20,000. 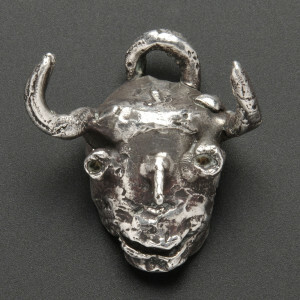 Arguably the most important of the Picasso offerings, a sculptural, Silver “Satyr” Pendant, featuring the familiar Picasso motif, brought $153,000. The round, Silver “Sun” Pendant fetched $141,000, while a brooch, etched in silver, depicting Picasso’s son Claude as a boy in profile sold for $92,250. 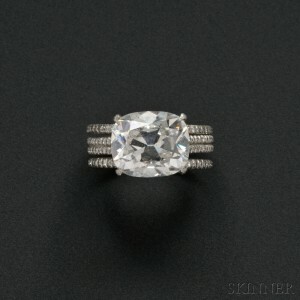 “Skinner treated my beloved Picasso jewelry with the respect and care they deserved. I was extremely pleased with the result of the auction and am also very glad that all three pieces will remain together with their new owner,” said Carole Mallory. The top lot was a Signed Platinum and Diamond Solitaire by Taffin, set with a cushion brilliant-cut gem weighing 6.08 cts, which sold for $225,000. Another standout diamond offering, a pear-shaped, 10.02 ct. Platinum and Diamond Solitaire brought $171,000. Skinner also saw impressive results for period gems at auction, including an Edwardian Amethyst and Diamond Drapery Brooch by Cartier, which sold for $18,450. A stunning, antique Sapphire and Diamond Lavaliere more than doubled the high estimate, bringing in $24,600. Natural pearls, a consistent favorite, saw great interest from buyers. Among the highlights: an Art Deco Natural Pearl Necklace, which sold for $98,400. Art Nouveau offerings proved to be in high demand, with an intriguing, serpentine Art Nouveau 18kt Gold, Opal, and Demantoid Garnet Necklace from the Collection of Rita Goodman selling for $44,280. Signed pieces, as expected, performed very well. Excellent results from a single-owner collection of Buccellati jewelry included an 18kt Gold “Hawaii” Necklace and an 18kt Gold and Emerald “Macri” Bracelet, which each sold for $11,070. A beautiful, signed Gothic Revival 18kt Gold Bracelet, Wiese, France, also realized a strong price, selling for $18,450 and smashing the pre-sale high estimate of $3,000. Several whimsical, figural pieces by Cartier drew enthusiasm from bidders, including a numbered and signed 18kt Gold, Coral, and Diamond Figural Brooch, designed as a park bench with a pair of coral and rose-cut diamond hearts, which sold for $18,450 – more than tripling the high estimate. 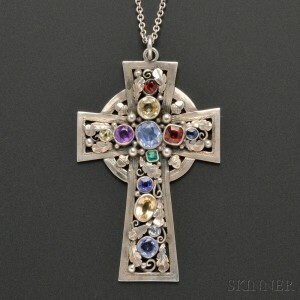 Edward Oakes’ Arts & Crafts Silver Gem-set Pendant, designed as a Celtic cross with bezel-set colored stones and acorn and oak leaf motifs was a surprise hit with bidders, fetching $27,060 – soaring past the pre-sale high estimate of $3,000. Daniel Brush offerings also performed very well, including a stunning, Archeological-style 22kt Gold and Sapphire Suite, which sold for $31,980. This entry was posted in News and tagged antique jewelry, art nouveau, auction results, boston auction, Buccellati, Carole Mallory, Cartier, Daniel Brush, diamond, diamond ring, diamond solitaire, diamonds, Edward Oakes, Fine Jewelry, Gloria Lieberman, jewelry, jewelry auction, Pablo Picasso, Picasso, picasso jewelry, Rita Goodman, skinner, Tiffany, Victoria Bratberg by Skinner. Bookmark the permalink.